I love a story where the hero does all the wrong things for all the right reasons. Giles, Marquess of Bromton did not have a happy childhood. Nor did he have the comfort and security of loving parents. All he has is his title and his honor but both are scattered to the wind with his mother's revelations. In pursuing the hand of Lady Katherine, he's doing his best to restore what he truly believes is the lost honor of his title. He thinks marrying her, thereby restoring her standing in society, and ensuring her child will inherit, will be good enough. He's delighted by his attraction to her but he knows nothing of love and doesn't expect this pairing to produce it; isn't even sure if he's capable of the emotion, having never experienced it. He's in for a big surprise. Giles isn't the only one keeping secrets. Scorned by society after two failed betrothals, Katherine retreated to her family's estate where she has devoted herself to raising her younger sister, managing her brother's estates, and teaching the children of her village. If there are parts of her that yearn to be set free, she keeps them in firm control. After all, the one time she allowed desire free rein it led to tragic consequences that drowned her in shame. She's captivated by Giles yet she can't shake the feeling that he's hiding something though the more she's with him, the fainter the echoes of suspicion become. By the time the truth is revealed, both Katherine and Giles' hearts are fully engaged but will their love be deep enough to fight for their happiness? I thoroughly enjoyed this first book in LaCapra's new Lords of Chance series. It's filled with the sparkling banter, witty humor, sensuality, and deep emotion I've come to expect from her stories. I loved Katherine's intelligence, her take-charge attitude, her loyalty to her family, and her innate kindness. I enjoyed watching her blossom as she begins to accept her worth and take charge of her happiness. And Giles, how my heart ached for him. He had lessons to learn before he could open his heart fully to the love and happiness just outside his reach. And when he finally does? Oh, my, how my heart fluttered! LaCapra has created an intriguing cast of characters surrounding our hero and heroine who already have me eagerly anticipating their own stories. I'm especially excited for Katherine's sister, Julia and the hero I so hope will become her own. 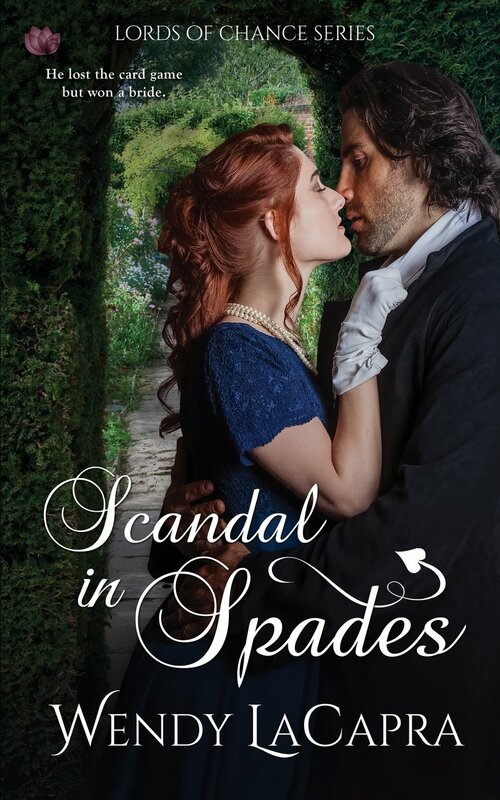 If you enjoy emotion-filled historical romance with wit, humor, complex characters, sizzle, a good grovel, and sigh-inducing endings, I highly recommend you give Scandal in Spades a try. Welcome to The Romance Dish, Wendy! Thank you, PJ! I absolutely love this blog! Scandal in Spades launches a new historical romance series for you. Please tell our readers what they should expect from this series. What can you share about future books in the series and do you have a publishing timeline? I’ve planned four books for the series. I’m not sure of the release dates, but the next two, one for ‘Diamonds’ and one for ‘Hearts’ are due in quick succession. The sparkling banter, battle of wills, and scorching chemistry between Lady Katherine and Lord Bromton were an absolute delight yet you kept me guessing until the very end as to whether they would be able to overcome the obstacles between them. What was it about this couple that convinced you they were destined to be together? OH! That’s lovely to hear. Thank you so much! Well, Lady Katherine and Lord Bromton both experienced an event that completely altered their self-worth. Katherine’s personality, her love for her siblings, and her inner strength helped her survive. In surviving, she became the perfect match for Bromton, not because of her bloodline, but because of her values. Bromton wants to be a better man, but doesn’t have the same resources to help him find his way. One of my favorite scenes in this book is when Bromton finally lets down his guard at The Pillar of Salt. What was your favorite scene to write in this book? The most difficult? I love that scene, too. The song he sings is a real drinking song, by the way. “Blowzabella my Bouncing Doxie” (Very Bawdy for its time). I think I had the most fun with the Billiards scene, though. And I cried when I wrote two other scenes- the carriage ride to London and the final scene between Bromton and Mrs. Warren. It was almost as if I was transcribing something I was watching. That almost never happens. Having four younger brothers, I especially enjoyed the dynamic between Katherine and her younger brother, Lord Markham. Please tell me you’ll be giving Katherine a chance to meddle in Markham’s love life when his turn comes around? Two secondary characters I thoroughly enjoyed were Katherine’s sister, Julia and Lord Rayne’s sister, Clarissa. Do you have happy endings planned for these two? I’m keeping my fingers crossed for certain heroes for each of them! I’m working on Julia’s story now! Julia was inspired by a young lady I met when we were both staying at her uncle’s home a few years ago. I’d never met someone with such sparkling energy & I just knew the world would be wowed by her when she was ready. We haven’t stayed in touch, but I thank her for that inspiration. Clarissa will have her moment to shine as a heroine, too. I’m not sure I *have* celebrated—it doesn’t yet feel real. I’m very proud of Her Duke at Daybreak. At the time, I felt like it was the best thing I’d written. If all goes well, the second book in that series, His Duchess at Eventide, should be out in August. It will be released as part of “Legends of Love,” a group of Regencies by different authors, each retelling a classic legend within the Regency. His Duchess at Eventide is a retelling of Odysseus’s return with more Penelope and (*winces*) without the infidelity/murder/plundering. Scandal in Spades was recently named one of my Most Anticipated Romances for 2nd Quarter 2018. What upcoming books are you looking forward to reading? I am SO excited about Mary Balogh’s Someone to Care. I’ve adored the Westcott series and I can’t wait for Viola’s story. I just finished Stacy Reid’s The Earl in My Bed, and *fans self*--what a fabulous story of revenge and reconciliation. I enjoy tagging along on your travel adventures through Instagram and Facebook. Any exciting journeys on the horizon? Actually, I’m about to take a long-planned trans-Atlantic repositioning cruise from Southampton, UK back home to NYC. I had hoped to spend some time in England, but, unfortunately, that’s not going to be possible. It’ll be a working vacation. Things have been kind of crazy this year, and I’m looking forward to being able to write without distraction and, of course, I’m looking forward to heading down to the bar in the evenings for music & fun! Where are the best places for readers to catch up with you online? I write under my own name, so if readers don’t mind family posts in the mix, they are welcome to friend me on Facebook. For those that prefer strictly book talk, I have a Facebook page. Twitter is probably the second most likely place to find me. And, I’m warming to Instagram. Thank you for taking the time to visit with us today, Wendy. Is there anything you’d like to add? Would you like to ask our readers a question? Thank you so much for having me! It’s a pleasure and an honor. I can’t think of a good question at the moment (unless your readers have tips on getting a good night’s sleep), but I would like to say thank you to everyone for joining me on this ‘visit’! Readers, let's help Wendy get some sleep so she can write more great books for us to read. What are your best tips for a good night's snooze? Two randomly chosen people who post a comment before 11:00 PM (eastern), April 21 will receive a digital copy of Scandal in Spades. I'm looking forward to reading Scandal In Spades. Sounds wonderful.Congrats on Her Duke At Daybreak Wendy. I too have trouble with sleeping. My daughter bought me a white noise machine which can lull you into sleep. But everything I've read said no electronics an hour before bed because it stimulates the brain. I grab a book and snuggle in and before I know it I've drifted to sleep. Good luck. I'm one of the lucky ones who has no trouble sleeping but I have friends who use a white noise machine and say it's very effective. Hi Carol! Thank you so much for your comments & encouragement! I have been eyeing white noise machines for ages. Perhaps I will make the plunge! And that's a great idea about powering down. I do still buy some of my favorites in paperback. All my best! Sounds good! I have a sleep mask to keep out any light. No electronics too. Glad your mask works for you! This sounds like a good story and I'm hoping that it will become available in print. I always read in bed for about 3 hours and it helps me drop off to sleep. Thanks for the info, PJ. I read every single night in bed. LOL. Thanks, Diane!! Entangled does make Scandalous books available in trade, although not in bookstores. I almost always read before bed, too! I don't have any sleep hints. I always have trouble falling asleep. I usually read or watch TV until I feel tired. Maybe you'll pick up some good tips from the other comments! I need to seek out this book! :) It sounds divine! And I agree about the NO electronics about 1-2 hours before bed. The longer I stay up watching TV, the less I can fall asleep. Same with the Kindle. I have to have a paperback for night reading. OOOH yesss! I do try a warm bath/shower if nothing else works. I haven't tried melatonin, though. I wonder if it is different between the back-lit kindles and the other kindles. Hummm... I've also read about weighted blankets. I'm intrigued, but they are kind of expensive. I understand that the relaxing breathe technique or 4-7-8 breathing technique is a natural and effective way to help fall asleep. It entails placing tip of tongue on ridge of gums behind upper front teeth for duration of exercise, inhaling through nose for count of 4, holding the breath for a count of 7, and exhaling through the mouth for count of 8 (making whooshing sound). That sequence of breathing is to be done 4 times. It is said to be able to help someone fall asleep within 60 seconds and I believe the technique is attributed to Dr. Andrew Weill. Hope that is helpful. I've never needed any help getting to sleep. Family members say I can fall asleep on a picket fence. Looking forward to reading your new book. Good to hear! My nephew taunts me with screenshots of his fitbit sleep cycles, because his are nice and smooth and all deep blue, while mine are all over the place. I'm glad to hear you sleep well. And thank you!! I wish I were able to sleep all night. I take a calcium and a magnesium tablet shortly before I get in the shower. Then, I use baby lotion with lavender on arms and hands. Then a melatonin tablet. Fall asleep and wake up about 3 and am unable to go back to sleep. I know reading a kindle before bed is not good because of the kind of light it generates. I am considering hiring someone to drop in at 3 AM, hitting me in the head and leaving quietly. I think that is the only method I have not tried. I feel you, Annette. Between 3-4 am is my witching hour, too. I usually open my eyes and am suddenly wide-awake with a plot point, something I want to research, a bill I should check, an email I forgot to answer or something else that seems terribly important at that time of night. All sorts of things follow- stretching, rose oil, counting backwards, showers, yada, yada, yada. I haven't yet cut out caffeine (because NOOOOOO) but it's now on the table. Something's gotta give. And, I'm going to try some of the above suggestions! This sounds like an interesting book. Thank you so much for the review and interview. Tip for sleeping is doing some mind emptying. Another is taking some tylenol before bed. Getting your body to relax is one more. Thank you, Eileen! I haven’t tried Tylenol! I am sorry! I understand.